An evening presentation entitled “Hallelujah,” depicting the story of the rebuilding of the ancient city, has been launched at the ancient City of David in Jerusalem. An evening presentation entitled “Hallelujah,” depicting the story of the rebuilding of the ancient city, has been launched at the ancient City of David in Jerusalem. The outdoor cinematic show is projected onto on-site ruins, using video mapping technology to highlight 3,000 years of history. 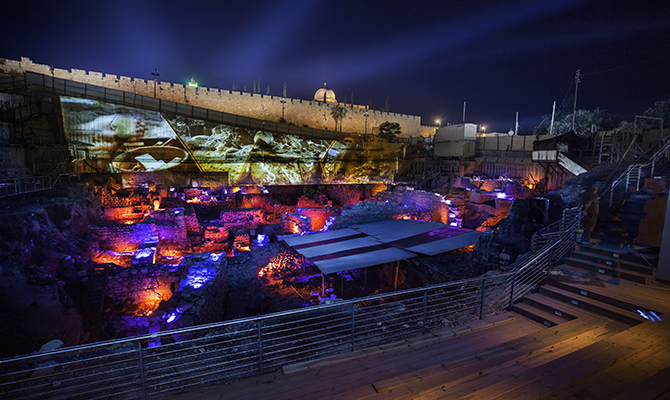 Presentations run for 75 minutes and comprise of two unique shows projected against the backdrop of the Old City walls and the ruins of the City of David. “Hallelujah” has one performance per evening available in English and two in Hebrew, and also offers various other languages via headphones.